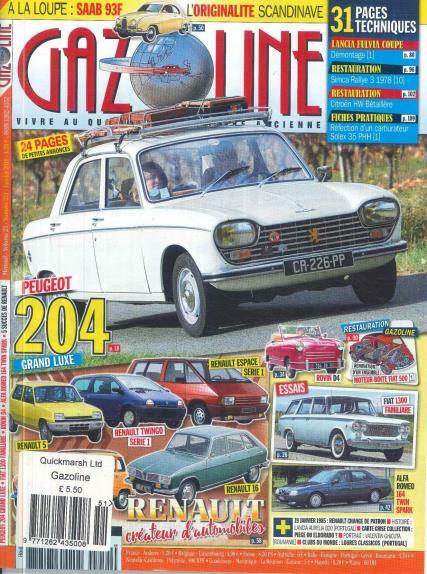 Gazoline is a french magazine for those that have a passion for older vehicles from the not so distant past. Buy a single copy or subscription to Gazoline magazine. Interesting restoration projects which shows step by step clear photographs. Showcasing vehicles from the last century through to the 70's, 80's and 90's. Imagine the fun of discovering that a 1975 Deville Sedan is being used as a taxi in Budapest, or spotting a Citroen GS Basalte from the 70's with its red and black stripes. These and many more exciting articles can be found in Gazoline.